By Beverly Morgan, IBCLC, Caroline L. Bias, M.S., CCC-SLP, Susan Chick, & Hilary Jacobson, CH.HU.SI. "There are no difficult babies; there are only babies who are having difficulties." When a baby is born, he moves from a familiar womb environment where light is barely perceived and sound from the outside world is muffled to a place full of new sensations that reach him directly through his eyes, ears, mouth, nose, skin and body. In the following weeks and months, a baby’s main education will be to understand what his senses tell him about the world. Not all babies are able to process this sensory information equally well. If a baby has difficulties in so-called sensory integration, which includes sensory processing and sensory responsiveness, this can translate into behavior that may be confusing for the parents. It’s helpful to remind ourselves that if our baby is being difficult it’s because he’s having difficulties. He may need extra help settling into life outside the womb. Respecting a baby’s signals and remaining patient is an important “first training” for parents. Patient and respectful parenting will help a baby become more successful with his overall development as time goes on. Babies are not alone in having sensorial issues. Even for adults, it is normal to have slight sensory issues. Sensory responses only become an issue when they make it difficult for a person to feel comfortable in his or her skin. Otherwise, they may be thought of as “quirkiness” or as an interesting personality trait. All of us react to our surroundings according to how our surroundings reach us through our senses. We can’t tolerate certain odors, for instance, or are sensitive to noise, or to light, or to constricting or scratchy clothing. If you recognize yourself in some of the descriptions in this article, it should give you comfort to know that people with sensory issues are normal people. As you go on to think about people you know, you may possibly see many instances of behaviors that are driven by sensory issues. Your Aunt Gertrude takes her shoes off as soon as she can. She walks barefoot whenever possible. Your Uncle Charley would never walk around barefoot, not even at home where he always wears snug slippers. Your toddler Jane hates those scratchy labels on clothing. She takes off her clothes as soon as she can. She does not want to wear tights, or hats, or any clothing she complains is “scratchy,” though you may not find the clothing scratchy at all. Your niece Patty had a hard time learning to climb stairs. She likes to sit and read books. She does not like to run around and play. Your brother Jack hates to go to crowded places. He says it gives him a headache. Your sister Jill always wears sunglasses. Her house is as dark as a cave. Your coworker Cliff often complains about smells. He complains about perfume, about smoke in restaurants, and about popcorn from all the way across the building. He is vocal about the smell of chemicals in the workplace when you don’t notice anything at all. People often do not recognize their own sensory issues. Without thinking about it, we develop preferences as well as avoidances and make life choices that help us feel comfortable. For instance, someone who is light sensitive may avoid light and prefer darkness. He might choose to live in a shadowy house, to work in a darkened room, or get a job that allows him to work by night and sleep by day. If you asked him why he made these choices, he might not make the connection that light hurts his eyes, gives him a headache, or makes him feel tired. A baby, though, is not able to make these kinds of choices. He cannot tell us what is causing him to feel badly, or what the solution would be. It is up to us to recognize a baby’s issues and to help him feel safe and comfortable. He is dependent on us to figure it out for him. If your baby is lethargic, or sleeping a lot of the time, or if he is fussy or seems unsettled, it is essential to first talk to your health-care provider to rule out health problems before exploring whether your baby is reacting to sensory overload. Adults commonly react to sensory overload by avoiding the situation when possible, by smiling and fading out, or by complaining or even by stamping their feet. Babies also have distinct ways of coping. What most people call a "good" or a "fussy" baby can actually be a baby's strategy for coping with sensory overload. An extremely placid or an extremely fussy baby may be exhibiting a coping mechanism, rather than a personality trait. You may recognize your child in one of the following descriptions. 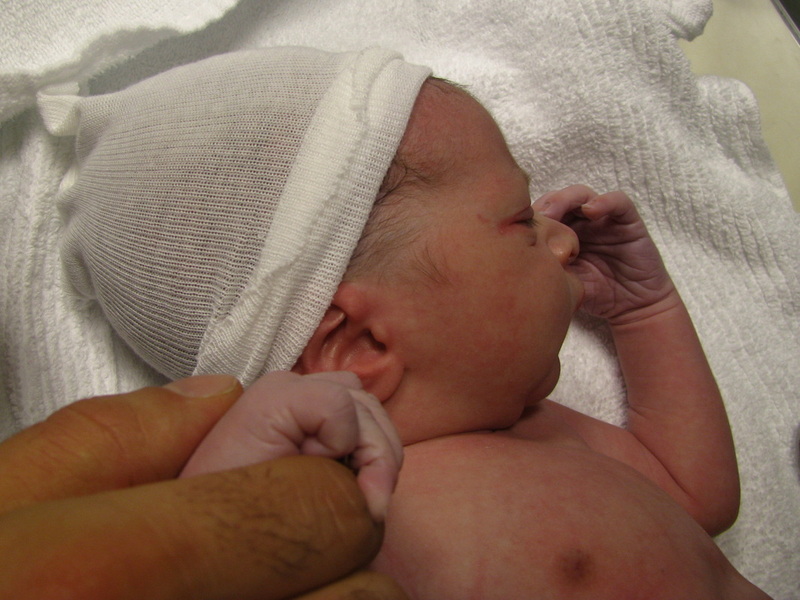 If a newborn is having a hard time adjusting to his new world, he might cry hard and long and be difficult to soothe. People notice this, especially new parents who want so much to make their baby comfortable and happy. Babies do cry, but if your baby cries for hours at a time in spite of what you do to calm him, he may be having difficulty processing the information he is receiving from his senses. People might remark that this baby is easily over-stimulated. Before assuming that sensory issues are involved, talk to your health care provider to rule out other possible medical reasons such as reflux or an injury. Another baby who is having difficulties might be placid and sleepy, so his sensory difficulties might go unnoticed. If your baby seems sleepy all the time he may be withdrawing from sensory overload. People would often call this child a “good” baby who needs to be awakened to eat. Before assuming though that sensory integration issues are involved, be sure he is eating and gaining weight well, and that there is no medical reason for his sleepiness (medications from epidurals used in labor still in the baby’s system, prematurely born, etc.). Remember that every experience a baby has is new. Babies are born with all their senses active, and they experience sensations simultaneously. Discovering what a baby needs can be complex and frustrating. For example, your baby may not like the way his blanket feels on his skin and he may ALSO need to be constantly in motion. You will not make him feel more comfortable by addressing only one of these items. The challenge to solve the riddle of a baby’s sensory issues will become especially pressing if the baby is chronically fussy or is slow to gain weight. In this section we discuss the senses in general, and then look at sensory integration as it relates to breastfeeding. We take in information from our environment through our senses on an ongoing basis. These messages travel to the brain through nerve channels. Our brain processes the information and then we react. Part of growing and developing is learning which nerve signals are important and which can be ignored. For example, initially your baby will be aware of all the sounds in his environment, but he will soon learn to ignore or disregard repetitive, on-going sounds such as the ticking of a clock, your air conditioner’s hum or the motor of the refrigerator. People can have different levels of sensory responsiveness, and be hypo-responsive or hyper-responsive to sensory information. Hypo-responsiveness or under-sensitivity is when not enough information gets through to the brain. The baby feels less sensation. Hyper-responsiveness or over-sensitivity is when sensation registers as being very strong. In the example of the air conditioner, a hypersensitive baby would not be able to disregard the humming sound. His brain would have him constantly “listening” to it as if it were very important. Just as we may let out a few choice words after a long day at work while getting into a traffic jam on the way home, babies already experiencing stress have a greater reaction to sensory stimuli. For instance, if the baby is overloaded from the noise and commotion of a morning at the mall, being put in a hot car seat could push him into a crying fit. Babies have changing levels of tolerance that can be unpredictable, just like our own. Where on one day you might relieve stress by choice words, another day you may sit back in traffic and decide to enjoy the break and listen to some music – you weren’t in a hurry anyway. A baby’s sensory state can change throughout the day, too. He might be hyper-sensitive to something at one time and then hypo-sensitive to it another time. He might be perfectly happy to eat cold applesauce one day, but the next won’t touch it until you warm it up. Keep in mind that change is normal. Unpredictable behavior is predictable. As the baby matures, so does his sensory processing. This does not mean a child with sensory integration issues should not seek evaluation or treatment, and wait to “grow out of it”. The earlier the age when treatment begins, the faster and more beneficial it will be. Touch messages are received by the skin. Our skin gives us information about pain and pleasure, touch and pressure. It lets us know a flame is hot before we touch it; it lets us know if we are sitting on a rock or a soft pillow. Touch-sensitive babies are distressed when sensitive parts of the body feel contact. A baby may cry, fuss and look uncomfortable when put in certain clothing, preferring soft fabrics that don’t scratch or have restrictive elastic. They may grow to be children who fuss about the seams in their socks or tags on the neck of their shirts. Some babies may be sensitive to particular types of touch, light or firm. For some babies, a firm, deep touch is calming. For others, a light one is preferred. Sometimes a light touch can be disturbing, such as a sprinkling of rain, or a light stroking on the skin, a gentle breeze, or the tickle of hair brushing on the face. Babies who like a deep touch may relax when they are held close or swaddled. As a newborn, this may be the baby who does not even seem to notice when he gets shots. Toddlers and young children who require firm touching may be the kids always bouncing off other children or crashing into the furniture. Touch sensitive babies may be called uncuddly. The eyes are the windows that allow us to look out at the world. They let us know if the light is too bright, and how to navigate through the terrain of our environment. A light-sensitive baby may sleep all day so as to avoid the over stimulation of light. He may need to be awakened to eat. He may prefer to eat at night when his senses are not feeling so overwhelmed by the light. He too, may be called a “good” baby that sleeps all day and needs to be awakened to eat. However, he may also be said to have “sleep issues,” since he prefers to be up at night so that his senses are not overwhelmed. Sound is picked up by receptors in the ears. We can derive pleasure from listening to music, from the sound of singing, and from the sound of laughter. Sound can also alert us to danger as in hearing a train whistle, or the growl of an aggressive animal. For some people, sounds are a jumble, and it can be hard to tune in to one sound. Sound-sensitive babies may either sleep through any noise or wake at a pin drop, depending on whether the baby is hyper- or hypo-responsive. Often this baby will sleep all day and be more active at night, when it is quieter and there is less assault on his ears. He may be called a “good” baby and parents may congratulate themselves at how well they have trained him to sleep though the sounds of a busy household. However the baby may be said to have “sleep issues” because he wants to be up at night when his senses are less overwhelmed. Conversely, the baby may take only short naps during the day, waking with each sound. By the end of the day he may be fussy, overtired and cranky. People may remark that he is easily over-stimulated. His parents may be accused of spoiling him because he wakes so easily. Smell is chemically perceived by receptors in the nose and is linked to the emotional center of the brain. Smelling something that you once ate while you were sick can remind you of the experience and turn your stomach. Smelling fresh bread can transport you to your Grandma’s kitchen. Smell-sensitive people can be distracted by odors, both pleasant and unpleasant, that others hardly notice. Taste is closely linked with smell. It is chemically perceived by the receptors on the tongue. Receptors in the inner ear note changes in our position in space. Toddlers and children enjoy some degree of movement or vibration, and many young children love to move, swing, and spin. Toddlers often enjoy spinning to feel that new sensation of dizziness they have discovered. This is normal. The movement and balance sensitive baby may need to be rocked in just the right way. If he craves movement he may want to stay in a baby swing or in an infant carrier or a baby sling while mother sways back and forth to help him remain calm. This is the baby whose mom is constantly moving the stroller back and forth, or swaying with the baby in her arms. In contrast, the baby who prefers to be still may cry when handled, and relax when put down. The baby might cry every time he is put into his car seat, or every time he is moved to have his diaper changed. Here, it is movement that is the culprit, and not the ultimate location. People may call this baby uncuddly. Our muscles and joints give us a sense of our body’s position. We don’t need to see our feet to walk, or to see our nose to scratch it. It will take a baby time to recognize he has power over his hands and feet, or to even recognize them as “his,” but the groundwork is already in place. Some babies/children who may enjoy extra input about feeling the boundaries of their bodies are comforted by sleeping under a heavier blanket because it gives them the input to know where the ends of their limbs are. Parents may find that as hard as they try to keep the baby’s face clear when sleeping the baby may like pulling the quilt up over his head when he sleeps. This is an especially alarming thing for parents worried about Sudden Infant Death Syndrome. The body, including the muscles and internal organs, produces sensory messages, too. Some important signals for a baby are cues for hunger, digestion, and elimination.